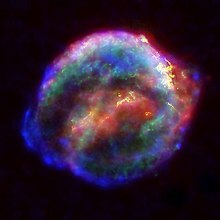 Multiwavelength X-ray, infrared, an optical compilation image o Kepler's supernova remnant, SN 1604. A supernova (abbreviatit SN, plural SNe efter "supernovae") is a stellar explosion that is mair energetic nor a nova. It is pronoonced /ˌsuːpəˈnoʊvə/ wi the plural supernovae /ˌsuːpəˈnoʊviː/ or supernovas. Supernovae are extremely luminous an cause a burst o radiation that eften briefly ootshines an entire galaxy, afore fading frae view ower several weeks or months. During this interval a supernova can radiate as much energy as the Sun is expectit tae emit ower its entire life span. The explosion expels much or all of a star's material at a velocity o up tae 7007300000000000000♠30,000 km/s (10% o the speed o licht), drivin a shock wave intae he surroondin interstellar medium. This shock wave sweeps up an expanding shell o gas an dust cried a supernova remnant. ↑ Giacobbe, F. W. (2005). "How a Type II Supernova Explodes". Electronic Journal of Theoretical Physics. 2 (6): 30–38. Bibcode:2005EJTP....2f..30G. ↑ "Introduction to Supernova Remnants". NASA/GSFC. 2007-10-04. Retrieved 2011-03-15. This page wis last eeditit on 25 Mairch 2015, at 06:20.